Sparkle and Shine: It might even be greased lightening!!!!! Doody : Like a beautiful blonde pineapple! So over Spring Break I purchased several new products that I absolutely love. Over the next few blog posts I will be reviewing them!!! 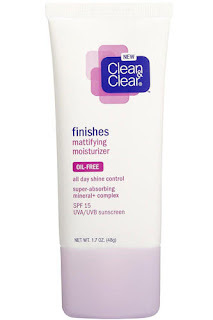 The first product that I bought was the Clean and Clear Mattifying Moisturizer. I bought this product because I needed a moisturizer and I saw this one on sale and just thought what the hey!?! Um I swear this is like fate stepping in. This is one of my new favorite products. I have slightly oily skin that is concentrated in my T zone. It gets slightly worse when it starts to get hotter. If you have skin like me or even pretty oily skin this product is a must. After I use this product my face is not shiny at all, it's like it just zaps away all oiliness or shine. It is AMAZING! I have stopped using a foundation primer because this works just as well. My makeup stays on better through out the day and I need absolutely no touch ups. Life changing stuff here ladies and gentlemen. There are some weird things I think I should talk about. For one it does leave a sort of whitish cast on your skin. It doesn't really bother me because I put it on under my foundation so I cant see it. Another weird thing is is dries really really fast. So the first time I put it on, I used the normal amount I used with other moisturizers and as I started trying to rub it in, it felt like I was pulling my face off because the product already dried. Now I use more and my facial skin stays intact. So there are some weird things with the moisturizer but they are seriously overshadowed by the greatness of the product. I totally recommend it GET YOUR HANDS ON SOME!!! !